My football books review series is back. In the first edition, I wrote about Franklin Foer’s How Football Explains the World. This time around, it’s a book that needs no introduction. Having sold over a million copies in the United Kingdom, it was named the William Hill Sports Book of the Year in 1992 and made into a Penguin Modern Classic in August 2012. 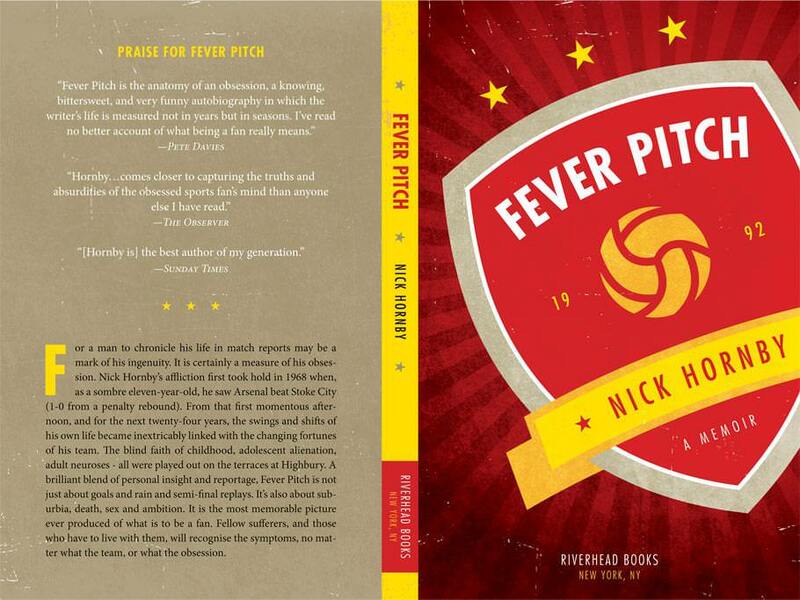 Nick Hornby’s Fever Pitch was even reprinted with a new cover and included as a part of the 2005-06 Arsenal FC membership pack for the “Final Salute” to Highbury. I recently finished Friday Night Lights by H.G. Bissinger and widely consider it as one of the best books about sports that I’ve ever read. Fever Pitch by Nick Hornby falls into the same category. It’s a narrative that is highly relatable for any fan of any sport that has a life-long relationship with a team and has knowingly and willingly embraced everything that comes with it. But one of its best selling points (just as with the latter) is that a basic knowledge of the sport is not a necessity for a reader’s enjoyment. You may not have any idea about the offside rule or a back-pass but that doesn’t stop you from wanting to read further or understanding the very core of the narrative which is human emotions and their stories. Hornby writes about being an Arsenal fan, about how it all started as and became a coping mechanism for his parent’s divorce and for his father to have a different means of communication with his young son. He writes about how he fell in love with football – ‘suddenly, inexplicably, uncritically, giving no thought to the pain or disruption it would bring with it’ – and how Arsenal began to dictate the ebbs and flows of the rest of his life. At a young age, Hornby’s life became inextricably linked with that of the North London club and for a large part of his adolescence and twenties, he truly believed that the fortunes of both were connected, sometimes even hating the club for being an addiction he couldn’t quite give up. That’s where the emotional relatability comes in. All fans and supporters of any team or club will identify with every tiny experience and emotion described by Hornby – the lack of control over something we invest so much of ourselves in, the hapless resignation to a lifetime of potential pain and heartbreak, the strong sense of belonging with an institution, with an idea and thousands of strangers, the illogical superstition and the rare moments of pure, transcendental joy and euphoria when your team does something magical and breathtaking. But equally there is much for the non-football fan to identify with. It’s about an uncomplicated love, about the instinctive choice of team, about a relationship just like our other relationships, albeit one where you risk your heart, soul, sanity and peace of mind weekly (twice a week when there’s European football), all the while knowing that it is a life-long commitment we can never break or move on from and one that will always regulate our moods. If not anything else, they can finally get an uncensored glimpse into the mind, life and psyche of a diehard supporter and hence begin to understand the fans in their close, personal lives. Fever Pitch traces Arsenal’s football journey from the time in 1968 a eleven year old Nick Hornby was taken to his first ever game at Highbury by his father, through the Double years of 70-71, the frustrations of an eighteen year old barren spell, the dramatic high of the 1987 Littlewoods Cup final, the once-in-a-lifetime occurrence on May 26, 1989 (a beautifully visceral description of the last gasp title win for Arsenal over rivals Liverpool at Anfield) and the title defence in 1990-91. The book is divided into sections and chapters with each headlining a particular Arsenal match. It is as much a history of the club’s fortunes over that time as the timeline of the writer’s own life, the stark bare facts of his personal and professional mistakes, his depression, his loves and laughs, his neuroticism as a Gooner and the at times ludicrous experiences as a home and travelling supporter. For young fans, it is not only a comprehensive history lesson about Arsenal, but also a window into a world much different than the materialistic, commercial, Sky Sports-fuelled universe of the Premier League. Back then, it was not always pretty, with the extreme hooliganism problem, the crumbling stadiums and facilities, the stand-only terraces and its resultant problems, but it was also much simpler with football as community and kinship, a form of escapism and the united feeling of being in a group of people who share your passion and know exactly what it means, even though each experiences a unique, individual relationship with the team. Hornby explores the then UK football culture but also a lot of other social issues of fan behaviour and psychology, identity, growing up and old while the team stays perennially young, the power of group mentality and most importantly, why even fully grown adults put themselves through so much for 22 men chasing a ball across a pitch. Best of all, he captures the elusive sense of being a fan and the moments that make all of it worth the wait, the trouble and the heartache. Anushree Nande is a part of the @Football_P family. You can follow her at @AnuNande.